Roses are probably the world's most popular plants, which is not surprising when you consider that they come in a fantastic range of colours, shapes and forms, and many have a beautiful perfume.The way roses are being used in gardens has changed over the years. Varieties with long stems have been popular for picking, and more recently they became cottage garden favourites. Today, catalogues are filled with roses which can be used as architectural or structural plants, and the most fashionable of these is the tall standard rose. Rosa 'Gold Bunny' flowers almost continuously. It has medium-sized, clear yellow blooms in a classic shape, and soft green, disease resistant foliage. It is available as a standard rose, a bush rose or a climbing variety. Amazing color of roses ! What a beautiful yelow rose! Great, great photos! This yellow is beautiful - the water drops make it look really refreshing! What an exquisite photo. One of your best, in my opinion. The most beautiful yellow rose! That is a beautiful photo. I love the little droplets. Happy weekend and thank you for hosting. That's a beautiful yellow rose! That's a beautiful rose, and great job taking the picture with the droplets. 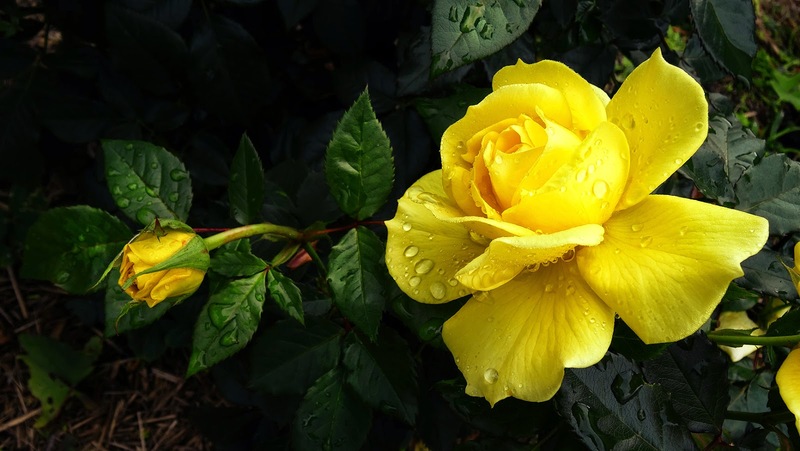 Lovely yellow rose! I can't wait for my yellow knock-out rose to start blooming next week! I will share it next Friday if it does. Thanks for hosting again!